One of the great stars of Design Indaba this year was Ferran Adria, the Spanish chef. Ferran Adria has been called the “Picasso of cooking” and “the greatest chef in the world “. His restaurant, El Bulli receives over a million reservations a year of which only eight thousand get a table. 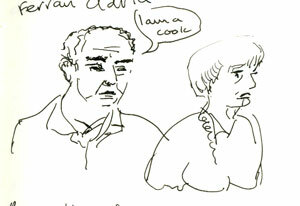 Ferran Adria spoke to us through an interpreter. Contrary to what one might think of a chef who is famed for his “molecular cuisine” and uses liquid nitrogen in his cooking, he repeatedly emphasized his respect for the past. There are two Ferrans, he explained. The cook, and the one who eats. To demonstrate the difference in approach, he drank a sip of water. “You do this every day”. But the cook, says Ferran, notices that the water has no colour, and little smell. He tests the taste, and the temperature and the texture. This awareness is the basis for Ferran’s style of cooking. Cooking is an unique art form, in which the audience makes the product a part of their bodies. The products are alive. Unlike other forms of design, there are no intermediaries between the audience and the creator. Ferran Adria emphasized the vulnerability of the chef’s work to their audience. ” If you don’t eat it properly, you destroy it”. He showed us a number of strange and bizarre ways that he prepares food, for example tomato shells created from juice frozen inside balloons and injected with foam amongst other innovations. I found a number of blogs by people who had attended El Bulli and written about their experiences. You can read one of these here. The images below are from one of these accounts. He strives to make you aware of the food in ways which are not necessarily pleasant . This liquefied truffle is an exploration of the importance of substance and texture. According to Ferran Adria, eating is deeply cultural, and cuisine is a truly universal language. Another theme in Ferran Adria’s talk was the nature of creativity. “You cannot be creative if you are not honest” and “creativity is not to copy, it is not a job, it is a passion. And passion is the most important thing”. Ferran Adria has been a source of inspiration for many chefs. You can read a blog by one of them here, as well as an New York Times article comparing the new American restaurants with El Bulli.